Limited to 16 people, we see a broad variety of the top attractions in the north and centre of the country while getting off the beaten path to visit lesser-known villages and rural areas. AIRFARE: Our flights specialist estimates the cost of the airfare to be approximately $1,300 Canadian departing Vancouver to CDG & returning from CDG. France is justifiably the world's most popular tourist destination. On our tour, we see a broad variety of the top attractions in the north and centre of the country while getting off the beaten path to visit lesser-known villages and rural areas. We see art and learn about events that have been pivotal to the development of European and world culture. We sample some of France’s famous wines and her delicious regional cuisines. Each day of the tour we include breakfast and one major meal. Usually, we enjoy dinner together but on some days we take lunch together, allowing you to choose your own special restaurant for dinner. Although this is not a war sites tour, we include visits to the 3 main Canadian sites from World War 1 and 2 – Vimy Ridge, Dieppe, and Juno Beach. On each of those days, we can suggest alternative sightseeing for those who do not wish to come to the war sites. We meet at Charles De Gaulle Airport outside Paris this the morning.Our pick up from CDG is timed to coordinate with the arrival of the direct Air France flight from Vancouver at 08.15am. We drive northwest of Paris to the tiny country village of Giverny, where impressionist painter Claude Monet lived and painted from 1883 until his death in 1926. Particularly impressive are his glorious flower-filled gardens. Dieppe: 77th Anniversary of 'Operation Jubilee'Today we are in Dieppe for the ceremonies commemorating the 77th anniversary of Operation Jubilee, the disastrous 1942 Allied raid sent in to test the strength of the German “Atlantic Wall.” Of just over 6,000 men taking part, 4,963 of them were Canadian. After only a few hours of a direct frontal attack up the steep pebble beach, 3,369 Canadians were dead or captured. Although valuable lessons were learned for the D-Day landings 2 years later, General Montgomery (Monty) said: “The price of this experience was truly excessive.” We visit the landing beach, the German defensive positions on the cliffs above, the Dieppe Raid Memorial museum and the Canadian War Cemetery. The monuments in the gardens of Square du Canada not only remember those who died in 1942 but the much earlier role of Dieppe in the founding and colonization of New France (Quebec.) 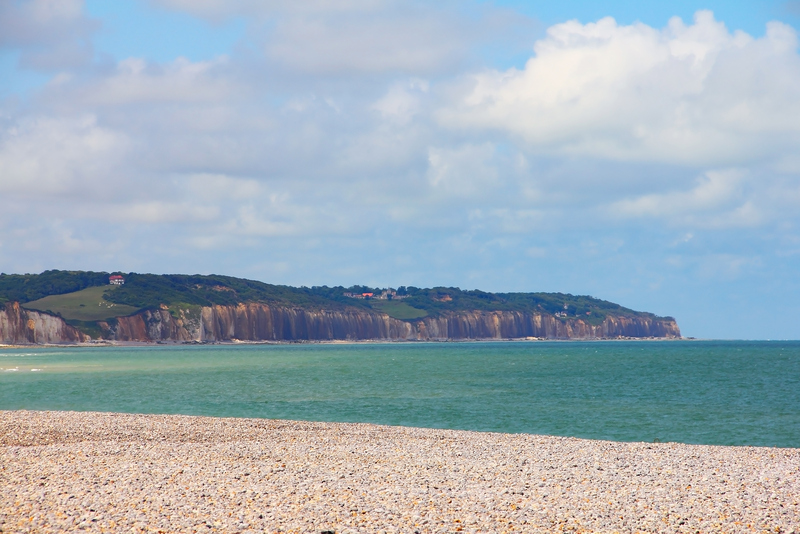 Dieppe was at the beginning of one of the branches of the Camino de Santiago de Compostela pilgrims’ route. We visit the Church of Saint Jacques, which houses a set of stained-glass windows commemorating the 1639 departure of 3 Augustinian Sisters to Quebec, where they founded the Hôtel-Dieu du Quebec—the first hospital in North America. We also see from the outside the impressive castle, which dominates the town and the beach from a high bluff. If you want to explore the museum inside the castle yourself, you will find an eclectic collection including Impressionist paintings of local scenes and one of Europe’s largest collections of carved ivory. For those who do not wish to come to the war sites, we can suggest alternative sightseeing today. Driving inland, we come to Rouen – the capital of the Upper Normandy region – situated on the River Seine 135 km downstream from Paris. At the Historial Jeanne d'Arc, we walk through medieval corridors of the Archbishop's Palace to watch and hear the dramatic retelling of Joan of Arc's visions, her victories over the English during the Hundred Years War and the trial that condemned her to be burnt at the stake here in 1431. 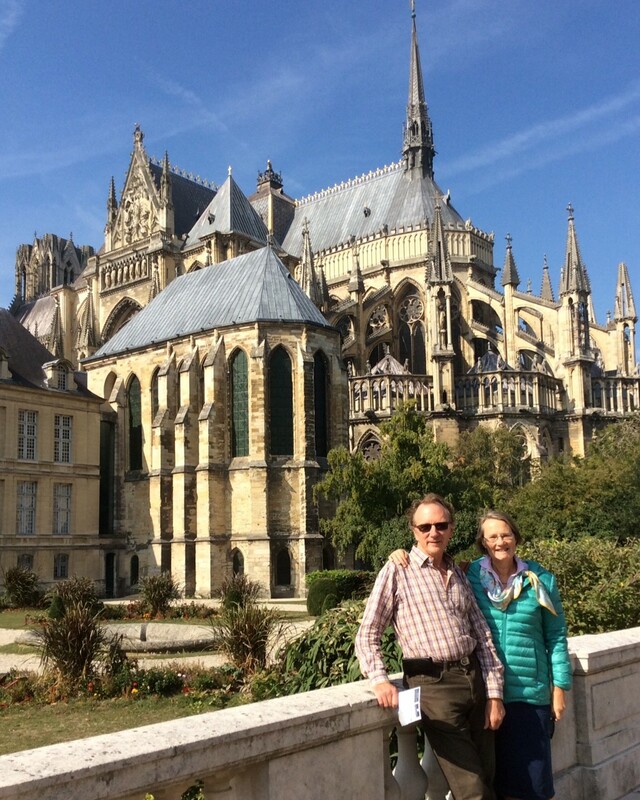 We tour incredible Notre Dame Cathedral – one of France’s finest churches – which dates back to the 4th Century. A new spire built in the 19th Century meant that the cathedral briefly qualified as the tallest building in the world. Monet painted over 30 canvases of the cathedral. Rouen was home to the author, Gustave Flaubert, best known for his scandalous novel Madame Bovar. From Rouen, we head back to the coast to picturesque Honfleur, at the mouth of the River Seine. This lovely seaside town has a quaint old harbour and narrow, cobbled streets. Originally a small fishing village, Honfleur became a popular seaside resort as a result of the famous impressionists who visited and painted the skies, the sea, and local landscapes. After free time for lunch we enjoy a guided walking tour to see the quaint 17th Century Vieux Bassin harbour, Place St-Catherine, with its wood-shingled clock tower, and the 15th-16th Century Eglise Ste­ Catherine which, very unusually for France, is made entirely of wood. It was from Honfleur that Samuel de Champlain sailed for Canada in 1608 to found the city of Quebec and the colony of New France. We travel south to Caen, the capital of Lower Normandy. Today, those who wish to can join us on our included tour of the area of the D-Day Beaches where, during the single day of June 6th, 1944, over 135,000 Allied troops landed on the 5 beaches code-named Utah, Omaha, Gold, Juno and Sword in the largest amphibious assault ever conducted. 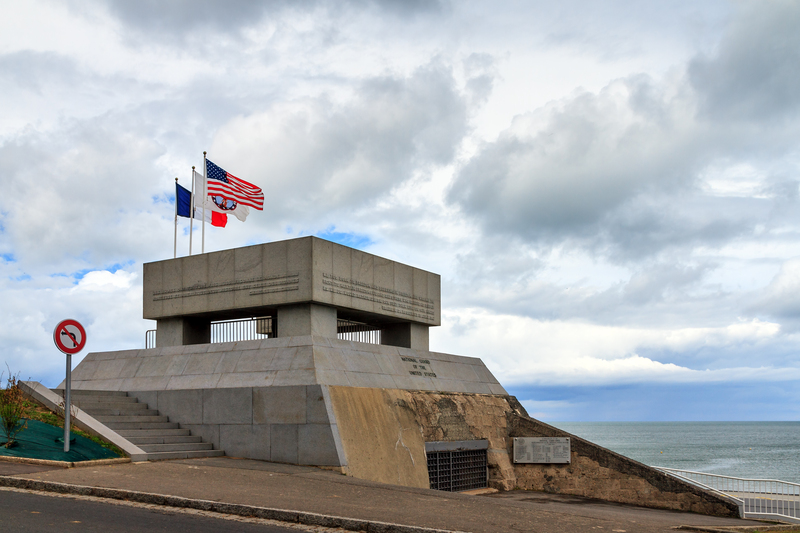 We focus on the Canadian sector, Juno Beach, where we visit the towns of Bernières and Courseulles, the Juno Beach Centre and the Bény-sur-Mer Canadian War Cemetery. In Arromanches, we see the remains of the gigantic artificial Mulberry Harbour which allowed up to 7,000 tons of weapons and supplies per day to be landed on these open, sandy shores. We also see defensive bunkers from Hitler’s much-vaunted “Atlantic Wall”, which the Allied troops assaulted 75 years ago. Inland we see Ardenne Abbey, with its memorial to Canadian POWs executed thereby fanatical SS troops. Caen, with its connections to William The Conqueror (William became Duke of Normandy in 1035) and built the commanding castle in 1060. Even today it is one of the largest medieval castles in Europe. The castle affords wonderful 360-degree views over the town centre and houses the Museum of Fine Arts, whose collection includes works by Rubens, Tintoretto, and Monet. Also within the Castle is the Museum of Normandy, which illustrates traditional life, history, and archaeology in the region. William’s tomb is in Caen’s most important medieval site, the Abbaye-aux-Hommes, while his wife – Matilda – is buried in the Abbaye-aux-Dames. Although the Allies successfully established their 5 beachheads by the end of the day on June 6th, 1944, it took them over a month to break out against dogged German resistance and capture Caen – just 17 Km away. Consequently, most of the towns between the coast and Caen were seriously damaged in the back-and-forth fighting. It is often said that “the people of Normandy paid the price for the liberation of France.” Over 20,000 Norman civilians were killed during June and early July 1944 – mainly by Allied bombing. However, the delightful town of Bayeux was spared. It is a short drive through lovely Norman countryside to Bayeux, where we visit the famous 11th Century Bayeux Tapestry depicting William the Conqueror's invasion of England in 1066. This unique 70-meter-long embroidery depicts 600 characters, 200 horses and 40 ships, along with hundreds of animals and mythological figures. No wonder it is inscribed on UNESCO’s “Memory of the World” register! We also see Notre Dame Cathedral, Bayeux’s magnificent Gothic cathedral begun in the 11th Century, which has beautiful stained-glass windows and a fascinating Romanesque crypt with pillars decorated with angels. 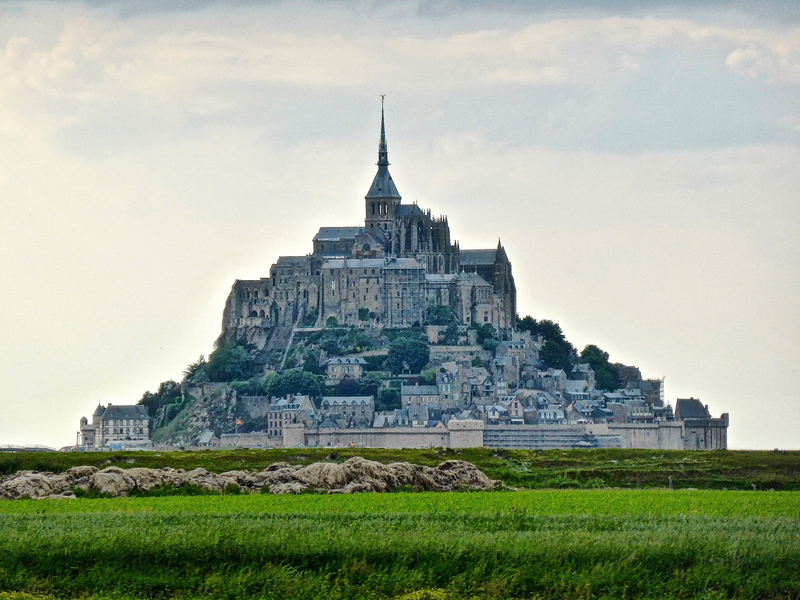 This afternoon we tour Mont St-Michel, the famous, dramatic-yet-delicate abbey set atop a 92-meter-high rock 1 Km offshore and connected to the mainland by a narrow causeway. The well-preserved Norman Benedictine abbey is surrounded by the winding streets and convoluted architecture of the medieval town. The island was designated a UNESCO World Heritage Site in 1979. According to legend, in 708 AD the Archangel Michael appeared in a dream to Archbishop Aubert of Avranches and commanded him to build an abbey on the tiny island. From then until the 16th Century a succession of Romanesque and Gothic buildings resulted in the grouping now standing so dramatically on the rock. In the Bayeux Tapestry, Norman knights are shown being saved from the quicksands in the tidal flats around Mont St-Michel during a battle with the Duke of Brittany. Driving west, we leave Normandy and enter its great rival, Brittany. 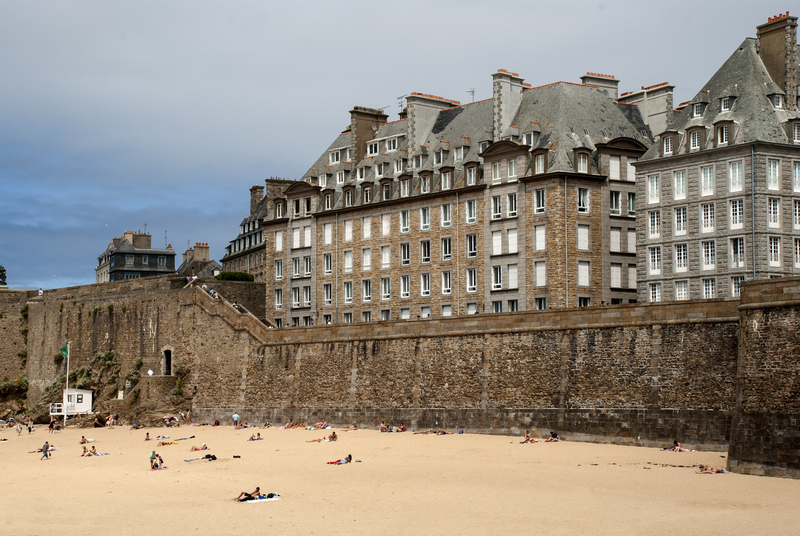 This morning we take a guided walking tour around the magnificent walls of St-Malo and into the charmingly-restored interior of this fortified medieval town at the north end of the Brittany coast, with its unusual 4- and 5-story buildings. This afternoon we visit nearby Dinan (sister city of Quebec City), one of the largest medieval towns in Brittany. Surrounded by 700-year old ramparts, Dinan is celebrated as one of the most exquisite towns in Brittany. We walk down the steep streets to the River Rance and enjoy the fascinating medieval buildings which are straight out of the pages of a fairy-tale book. 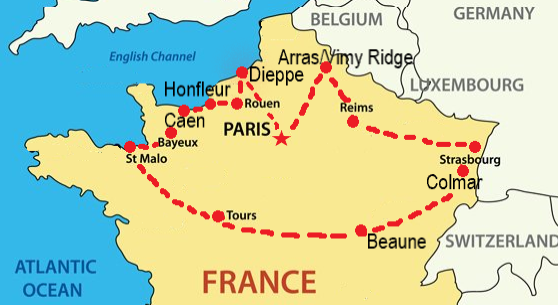 This morning we leave the north coast for central France and the town of Angers, the western gateway to the Loire Valley – a UNESCO World Heritage Site. The Chateau d'Angers is very different from other chateaux along the Loire River. Its walls are of black slate – usually used for roofs – and its towers are topped with white tufa – a stone usually used for walls! It was built in just 10 years during the 13th Century to defend the Loire Valley against the English. We see the stunning Tenture de I’Apocalypse, the oldest tapestry in the world. Commissioned by Louis I, Duke of Anjou, and completed between 1375 and 1380, this 104-meter long wool-and-gold-thread masterpiece depicts scenes from The Book of Revelation. In the 1800's it was cut up because it muffled the voices of the choir members but, in 1848 a very patient church member sewed it back together again! We can walk around the ramparts of the 2.5 meter-thick walls with their 17 massive round towers, which afford spectacular views over the town and the river. At St-Hilaire-St-Florent we stop for a tour of the French National Riding School, where France’s Olympic equestrian team trains – they last won gold in Rio in 2016. This area has been an equestrian centre since 1593. 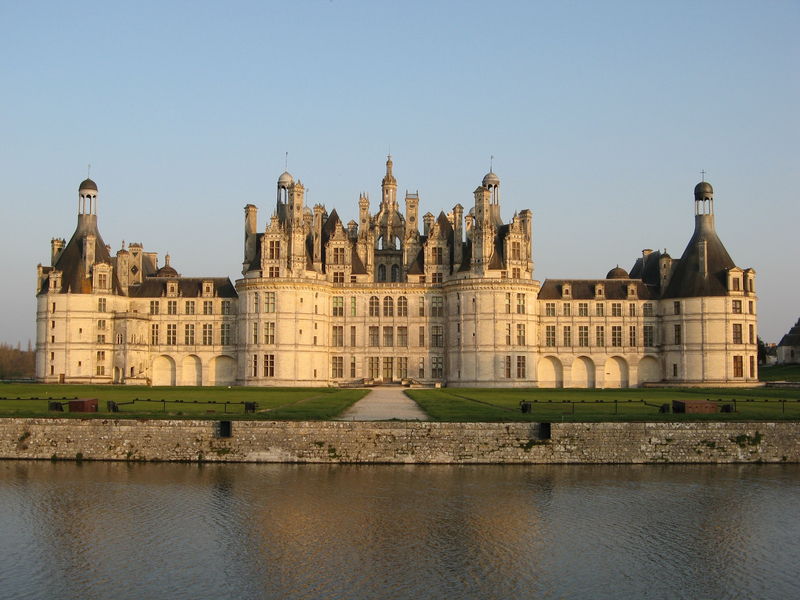 Travelling east, we visit the Chateau de Chambord – the largest chateau in the Loire Valley. Set in 5,500 acres with 440 rooms and 365 fireplaces, this was meant to be just a hunting lodge for Francois I who started work on it in 1519 and never stopped until he was completely broke. Returning west, we stop briefly in the attractive town of Amboise with its lovely castle towering above. First built in the 15th Century, the delightful church of St. Hubert within the chateau grounds is reputed to be the burial place of Leonardo da Vinci, who spent the last 3 years of his life in Amboise. This afternoon we visit the gorgeous Chateau de Chenonceau. Accessed by a long, tree-lined driveway leading to lovely formal gardens, this elegant building literally straddles the Cher River. Known as the prettiest chateau in the Loire region and the “Chateau of the Ladies” (as it was completely overseen by women), it has a series of sunlit galleries overlooking the water. The main body of the castle was built between 1513 and 1521 when Henry II’s mistress, Diane de Poitiers, added part of the chateau as a bridge over the river for easy access to her hunting grounds. The bridge galleries served as a field hospital during World War 1 and as an escape route for the French Resistance during World War 2. This morning we drive across the middle of France to the beautiful medieval town of Beaune, the historic wine capital of Burgundy – located only 100 Km from France’s eastern border with Switzerland. Beaune was the residence of the Dukes of Bourgogne until 1477 when the French king Louis XI annexed the town. Upon arrival, we take a guided tour of the Hotel-Dieu des Hospices de Beaune, built in 1443 to support the town’s inhabitants who had suffered during the Hundred Years War. This architectural jewel served as a hospital right up until 1971 and is now a museum and art gallery. We will see its colourful ceramic roof tiles laid out in an intricate geometric pattern, the medieval courtyard, the vast “room of the poor” and The Last Judgment painting. 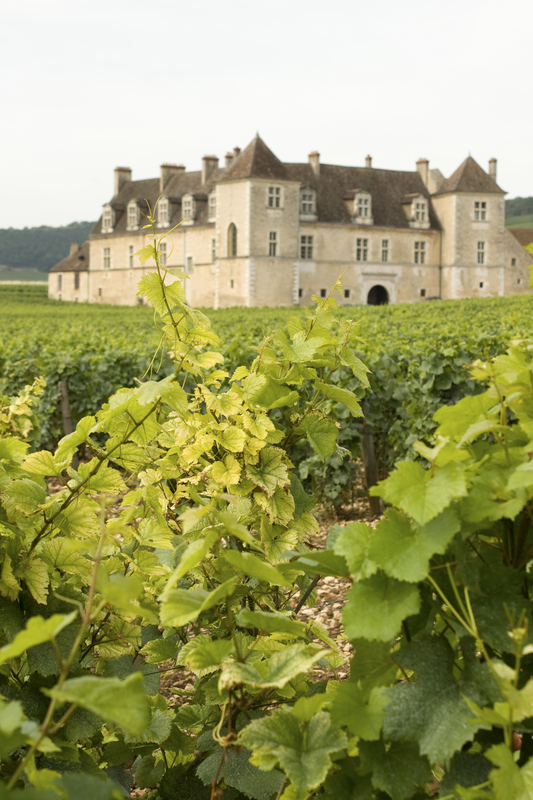 The Hotel-Dieu owns many famous vineyards, many of which enjoy Grand Cru and Premier Cru status, bequeathed to it by grateful patients over the years. Some of the cellars run deep beneath the Chateau de Beaune, a former royal fortress built in the 15th century by King Louis XI, providing ideal aging conditions. The Swiss-born Chevrolet brothers, who moved to the US and created one of the world’s best-known car brands, were brought up in Beaune. This morning we visit in the ancient capital of the region, Dijon, and its wonderful covered market. You have a chance to see the original shop of Maille, where Dijon mustard was created. The town is also known for Crème de Cassis, the blackcurrant liqueur. We enjoy the architectural splendor of the city’s historic centre, including the Palace of the Dukes of Burgundy. Extending 60 Km south of Dijon are some of the most famous vineyards in the world – the Côte d’Or (the Golden Slope). This afternoon we enjoy a wonderful drive through some of the Burgundy wine villages, starting in Gevrey-Chambertin and winding our way south along Le Route des Grands Crus through the vineyards and wine villages of Chambolle-Musigny and Clos de Vougeot. We return to Beaune through the villages of Puligny-Montrachet and Meursault, famous for superlative white wines. En-route, we visit one of the wine chateaux, Le Chateau du Clos de Vougeot, where we see the enormous 13th-Century winepresses installed by Cistercian monks and sample some of their wines. This evening is free for you to choose your own restaurant for dinner in an area famous for classic dishes such as Boeuf Bourguignon and Coq au vin (at your own expense.) The immediate area has 29 Michelin-starred establishments! This morning we drive into the Alsace region, which lies between the Vosges Mountains to the west and the Rhine Valley to the east – forming the border with Germany. This is an area of hillsides covered with vineyards, orchards, and fairytale villages. Alsace also has some of the most beautiful cathedrals and churches in Western Europe. Over the course of its tumultuous history, the area has changed hands between Germany and France on several occasions – so Alsatians are extremely proud to be French today. You will see more French flags on the streets here than in any other area of inland France. Colmar is unquestionably Alsace's most beautiful, lovingly-restored town – once the royal residence of Charlemagne. It is almost on France’s eastern border with Switzerland and Germany, so the German influences are strong here. This afternoon we take a guided tour of the magical Old Town with its picturesque cobbled streets lined with half-timbered houses. During your free time this afternoon you may like to visit the Musée d’Unterlinden museum/art gallery with paintings by Monet, Picasso and Renoir, and the late-Gothic Issenheim Altarpiece – considered to be one of the most profound works of faith ever sculpted. 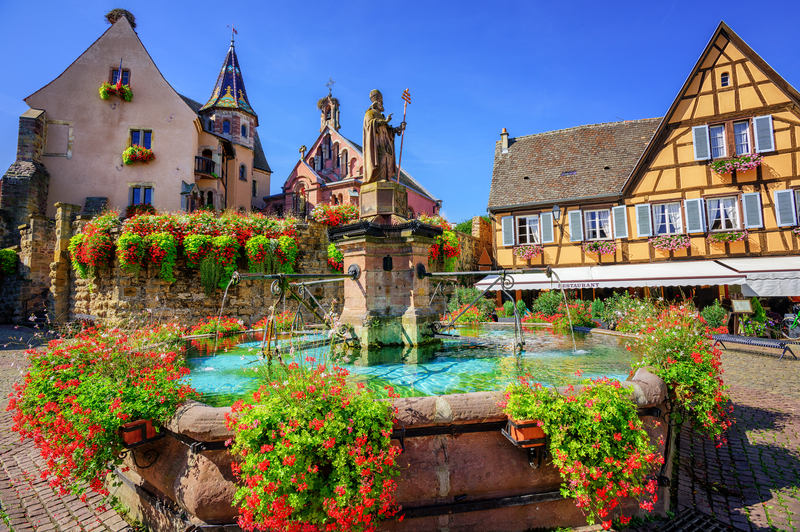 Eguisheim is regarded by historians as the cradle of viticulture (the science, production, and study of grapes) in Alsace. It has 3 ruined castles and 12th-Century walls still surround this delightful little town of winding lanes and quaint half-timbered houses whose doorways frequently display a date and a coat of arms. The Route du Vin, the oldest “wine road” in France, rolls through 60 charming villages and is flanked by the Vosges foothills, with medieval towers and feudal ruins evoking faded pageantry. The vine-covered slopes sometimes reach a height of 435m (1,427 ft.) and an estimated 20,000 hectares (49,400 acres) of vineyards line the road. Some 30,000 families earn their living tending the grapes. This morning we drive a little north on the “Wine Road” past vine-clad hills dotted with castle ruins to Ribeauvillé, which has two towers – now topped with storks' nests – remaining from its ancient fortifications. The Wheat Market, a 16th-Century Gothic building with two arches, leads to tiny Rue des Tanneurs with its old shop signs and lovely flower-decorated houses. In nearby Beaville the textile factory has been making high-quality linens since 1759 when Louis XV issued a decree which allowed the full development from a local craft to a prestigious royal industry. The workshop has been refining and perfecting its knowledge of fabric printing ever since! The factory has been allowed to display the label “Living Heritage Company” since 2009. 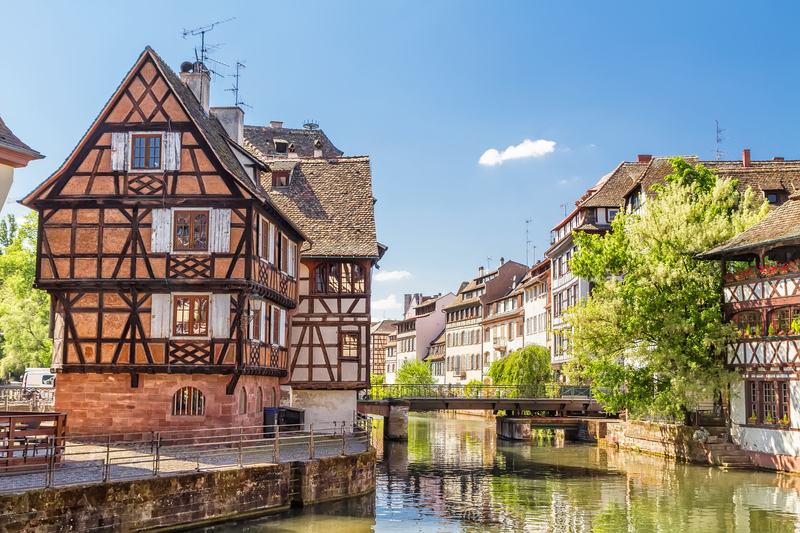 Today we explore Strasbourg, the capital of Alsace and one of France’s most bustling cities. Our guided tour includes the Cathédrale Notre-Dame in the heart of the city – a unique example of a mix of Roman and Gothic architecture. The cathedral only has one tower and is built of pink Vosges grey stone, giving it the nickname the 'pink angel of Strasbourg'. We also see the Palais Rohan, known as the 'Versailles of Alsace', and the most picturesque quarter of Strasbourg known as Le Petite France. We also see the Ponts Couverts (covered bridges) – 3 bridges and 4 towers at the dividing point of the River Ill which are vestiges of the city's 14th-Century fortifications. This morning we drive into the Champagne region, where we explore the vineyards and charming villages which produce the most famous sparkling wines in the world. We visit the former Benedictine Abbey of Hautvillers and its church, where celebrated monk Dom Pérignon “invented” sparkling wine around 1700. Later, his name was given to one of the most famous brands of champagne. We visit the 'Capital of Champagne' at Épernay, where the main street is lined with opulent mansions and neoclassical villas, rebuilt after WWI and now housing illustrious maisons de champagne. We discover some of the most prestigious names, including Moët & Chandon, Perrier-Jouet and Mercier, and learn about the 100 kilometers of tunnels beneath the street where the wine is matured. Champagne is included on UNESCO’s World Heritage list and MUST be produced in this region – anything else is just sparkling wine! Of course, we also include a champagne tasting. This morning we explore Reims, including the magnificent Gothic “cathedral of angels.” Along with the cathedrals of Chartres and Amiens, the Notre-Dame de Reims is a member of the illustrious triad of 'High Gothic' or 'Classical' French cathedrals built in the 13th Century. Built on the site of an earlier basilica where the first king of a united France, Clovis, was baptized by Saint Remi in AD 496, it became the tradition in 816 to crown the rulers of France here – a tradition that was carried on for over 1,000 years until the coronation of Charles X in 1825. Because Reims was close to the battlefront for the whole of the 4 years of WW1, some of its stained-glass windows had to be replaced. Today it has a variety of stained-glass windows dating from the 13th to the 20th Centuries, one paid for by the champagne producers’ association which, not surprisingly, shows the whole champagne production process in a ‘religious’ context! We also hear about how peasant-girl Joan of Arc brought Charles VII to Reims to be crowned. This long-awaited event boosted French morale and paved the way for the final French victory in the Hundred Years War against England. Joan was later canonized as a Roman Catholic saint. Both the cathedral and the Palace of Tau next to it are on the UNESCO World Heritage List. We also visit the palace, a lavish former archbishop’s residence, redesigned in neoclassical style between 1671 and 1710. It was here that the French princes stayed before their coronations and where they threw sumptuous banquets afterward. After our guided visits, you have free time to explore the elegant historical city of Reims. You may like to visit the Museum of Fine Arts, the Basilica of St-Remi (also a UNESCO World Heritage site) or the Museum of the Surrender – the modest schoolhouse that served as General Eisenhower’s HQ and witnessed the first surrender of Nazi Germany on May 7, 1945. This afternoon we drive to Arras which, although heavily shelled during various phases of the Battle of the Somme during WW1, has two of the finest Medieval squares in France. Like many town centres in France, Arras is paved with cobblestones. The town's two great squares were originally designed to accommodate large markets which, in different periods, contributed greatly to the prosperity of the city. In 1492 Arras became part of the Spanish Netherlands and this helps explain the style of the architecture - with 155 unique Flemish baroque facades. Arras was only retaken by the French in 1640 at the time of Louis XIII. We explore this delightful town with our guide this morning before learning about Arras’ critical role during WW1. 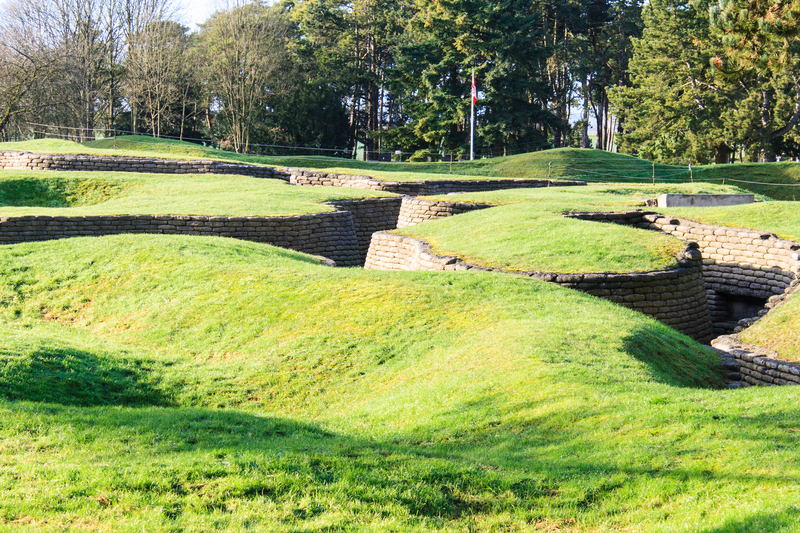 For the first 2 years of the war, after the fighting had settled into static trench warfare, this part of the Western Front was manned by the French army. In late 1916, the British and their “Colonial” allies took over and prepared to mount a massive assault on the nearby German positions. After so many attacks had failed at a huge cost in human lives, the Allies spent the winter of 1916/17 meticulously planning a massive new assault. Secrecy was critical so, during the month of March 1917, New Zealand miners dug miles of tunnels connecting up old chalk mines under the streets of Arras. By early April these “Wellington Tunnels” housed command posts, kitchens, sleeping quarters and even a hospital, protecting around 24,000 troops. At dawn on April 9th, tens of thousands of Allied soldiers burst out of the tunnels into a snowstorm and charged the nearby German trenches to begin the Battle of Arras. This was the first time that the four divisions of the Canadian Corps had fought together, rather than being divided among British Army units. Their objective was to take the high ground known as “Vimy Ridge”, which had held out against all previous Allied attacks. Over the course of the next 4 days, the Canadians captured and held Vimy Ridge against repeated German counter-attacks. This was a defining event for Canada and created enormous national pride back home. With our guide, we tour the Wellington Tunnels and visit the 100-hectare (250-acre) portion of the former battleground which serves as the visitors’ centre and memorial park, managed by the Government of Canada. Here we will learn more about the background to the battle, see reconstructions of the Allied and German trenches facing each other such a short distance apart and see the enormous Canadian National Vimy Memorial, which took 11 years to design and build and was unveiled in 1936. Those who do not wish to join us on our tour of the Wellington Tunnels and/or Vimy Ridge can enjoy that part of the day free in Arras. You might like to visit the Fine Arts Museum and the Hotel De Ville town hall. Later this afternoon we drive to our hotel near CDG, ready for our flight out tomorrow. Our transfer from our hotel to CDG is timed to coordinate with the departure of the direct Air France flight to Vancouver at 10.25am. Breakfast if not leaving too early. We have NOT included any time in Paris itself because so many members of the group will have visited the French capital before. However, we can book a hotel for you in Paris before or after the tour – so you can enjoy the “City of Lights” at your own pace and coordinate with meeting our tour at CDG or staying on in the city after our tour. - Accommodation mainly in good 3-Star hotels. All our hotels have en-suite bathrooms and heating. - Land transport by our own coach. - Breakfast & dinner daily EXCEPT on Aug 23rd in St-Malo, Aug 25th in Tours, Aug 27th in Dijon and Aug 30th in Colmar – when we include lunch instead of dinner. - Lunches - EXCEPT on Aug 23rd in St-Malo, Aug 25th in Tours, Aug 27th in Dijon and Aug 30th in Colmar – when we include lunch together. - We do NOT include porterage. Porters MAY be available to help you with your suitcase and you should be prepared to tip them if you use their services. Please only bring one piece of luggage per person and make sure your luggage has wheels so you can move your own luggage when necessary. .- Arrival & departure transfers. We can arrange individual or group transfers when you have confirmed the arrival & departure times of your flights. Please contact us for a quote. Our flight specialist suggests direct flights from Vancouver with Air France into and returning from CDG, Paris. You do NOT have to come to Vancouver to join this tour. You are welcome to book your own flights or we can put you in touch with our flights specialist. Please let us know. Our published price is based on 2 people sharing a room. If you wish to be guaranteed a single room, there is a Single Supplement charge of $1,428 Canadian. Those people traveling alone but wishing to share will be informed 3 months prior to departure if a roommate is not currently available. At that point, you will be invoiced for the Single Supplement. If a roommate subsequently joins the tour, your single supplement will be refunded with the final documentation. The land portion of the tour must be booked directly with Royal Heights Tours. You can secure your place on the tour with a $400 per person non-refundable deposit. We take payment by cheque, Visa or Mastercard for the $400 /person deposit. Your invoice for your Land tour will be e-mailed to you in mid-May 2019. Payment will be due by June 18th, 2019. Price quoted is for FINAL PAYMENT by cheque. Should you wish to pay the outstanding amount for the LAND tour by credit card there will be an administration fee of 3% on the outstanding amount. -This tour is not suitable if you need walking assistance in the form of walking sticks or canes. You must be in reasonably good shape to enjoy this tour – there is a lot of walking and exploring through the back streets of old historic towns where our bus cannot travel. We will spend a lot of our time exploring by walking over cobbled streets and uneven surfaces. I have travelled with your company previously and was thoroughly impressed with it. I knew that I would be well taken care of, and I was. I really enjoyed it all. As the whole “idea” of Iceland has always intrigued me, this tour provided a nice balance of history, nature, science and current affairs. Really enjoyed it all.